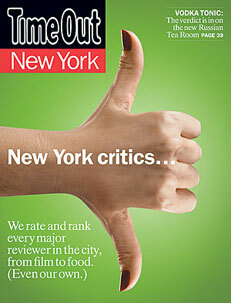 Time Out comes out this week with a big cover-story poll on the New York critics. In every field. We set out to review the reviewers, our own included. First, we developed a system of grading, on a scale of one to six, using five categories: knowledge, style, taste, accessibility and influence. Next, we enlisted panelists, from publicists to curators and artists—in other words, the people most likely to be directly affected by criticism—to use our system to rate NYC’s arbiters of taste and to provide (anonymous) comments. Complete list of panelists here. Even some bloggers' votes were also solicited, including yours truly. So take a look at the theatre roundup. You may be surprised. For instance, lowest scoring? Hilton Als! Not Charles Isherwood. So, according to this panel (on which either no playwrights were asked to participate, or agreed to) the most "stylish" theater writer in New York is John Simon? Terry Teachout has some coverage of it as well. Yes, I recommend Isaac's post at Parabasis, and follow his link to Appollonaire at artsjournal.com. The inclusion of the "Influence" category does indeed skewer the theatre poll to the Times critics. So that methodology is worth questioning. However--note that the Times critics do NOT rank highest in the other categories, like film and music. Who knew that the Voice, for instance, was more "influential" in film than in theatre! A slight sidetrack, but the Voice's putative "influence" in film seems to be skewed by an overreliance in the (tiny) sample on "downtown" movie types, indie movie publicists and the like. Also, in movies, as opposed to the other fields, it's extremely peculiar to leave out critics who write for national publications but to include The New Yorker as if it's a local city mag. Here's a re-ranking if you remove influence, which, as you and Isaac point out, doesn't belong here, and also remove "accessibility" (which I would argue should really be a part of "style"). So this is the Time Out ranking by what I would call the critical essentials: Knowledge, taste and style. That said, I still think you'd need to get about ten times the number of theater professionals, bloggers, etc. to participate for this to be useful. Hilton Als is, in no remotely realistic version of the theater universe, the worst critic in New York, or close to it. And while I'm sure there are people out there who would still argue that John Simon is the best, I bet his top ranking would not hold in any sampling larger than 20 people. And how about some commentary on the preponderance of white men in the job. One woman and one man of color in 2006. Not at all to say that all white men bring the same set of tastes, which is as silly as it is false. But who would argue that some diversity of background and life-experience wouldn't make for an overall richer discourse? And why -- genuine question, not rhetorical -- do people think this hasn't changed at all? Final question (sorry about the long post): Why wasn't Brustein at New Republic included? And, speaking of the paucity of women, doesn't Alexis Soloski count? In another pointless but fascinating focus on critics, last week, Britain's Independent ranked "Fleet Street's theatre critics" (I resort to scare quotes because they didn't stick to Fleet Street but they did leave out some important critics). Also mostly male and predominantly Oxbridge. It's also worth noting on the taste/sensibility front that, in a situation such as Brantley vs. Isherwood, you can never get a true comparison because--writing for the same publication--they do not review the same shows. unfortunately for david cote (whose reviews i've both appreciated and been baffled by), coming out on top of a list where isherwood is #2 is a bit like being named greatest movie on a list where "crash"* is ranked second. kinda takes away any credibility of the thing.